Home aimee carter carter dexter goddess interrupted romance the goddess test waiting on wednesday Waiting on Wednesday! Waiting on Wednesday is a weekly meme created by Breaking the Spine. Waiting on Wednesday is where I show you my most anticipated upcoming book. 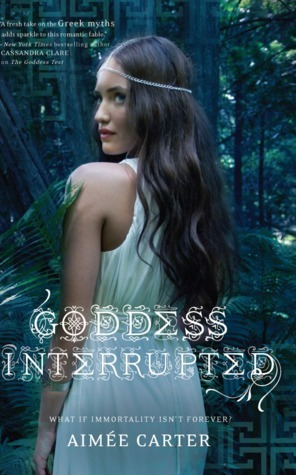 One of my most anticipated books is Goddess Interrupted by Aimee Carter. From the author - Kate Winters has won immortality. But if she wants a life with Henry in the Underworld, she'll have to fight for it.Becoming immortal wasn't supposed to be the easy part. Though Kate is about to be crowned Queen of the Underworld, she's as isolated as ever. And despite her growing love for Henry, ruler of the Underworld, he's becoming ever more distant and secretive. Then, in the midst of Kate's coronation, Henry is abducted by the only being powerful enough to kill him: the King of the Titans.As the other gods prepare for a war that could end them all, it is up to Kate to save Henry from the depths of Tartarus. But in order to navigate the endless caverns of the Underworld, Kate must enlist the help of the one person who is the greatest threat to her future.Henry's first wife, Persephone. The first book in the series, The Goddess Test, was a really fun read. I recommend this to anyone who likes romance, laughs, drama, intrigue, and/or greek mythology.